Thread: Juicy 3.5 pad gone bad? My new Trek Fuel EX from last year came with Avid Juicy 3.5 discs, and while the rear locks up fine, the front is just weak the first 5-10 min; initially takes 2-finger braking with only the front brake almost at max strength, going down ~20% grade. I've only ridden it under 50 or so miles (slacked off majorly since getting a job), so it's been sitting in the garage for months. 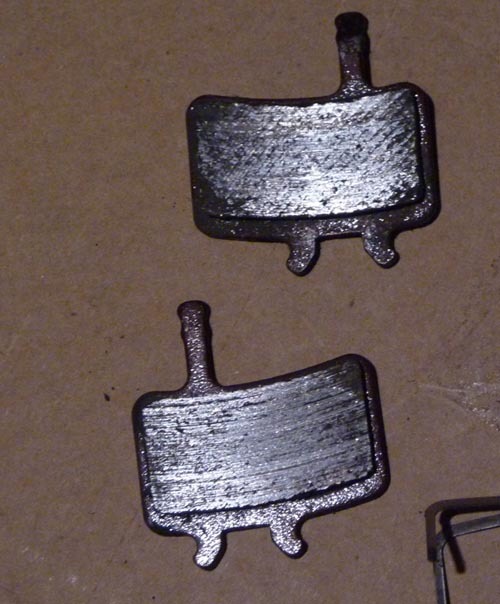 Below are pics of the pads and rotor. I'm wondering if it's "glazed"? It's seen rain and mud, so maybe oils got in? Also, the bottom pad (and top one, to a lesser extent) seems like only about half are in contact with the rotor, judging by the darker patch. I'd like some feedback before trying sanding it and cleaning with alcohol. If new pads are required, do I need a new rotor? 50 miles you don't need a new rotor. No harm in giving the pads a light "sand" and wipe with alcohol. Also wipe the rotor with alcohol too and a very light "sand" won't do any harm either. I would just use steel wool on the rotor to lightly graze the surface. Re bed the pads and see how you go. With regards to the pad wear. 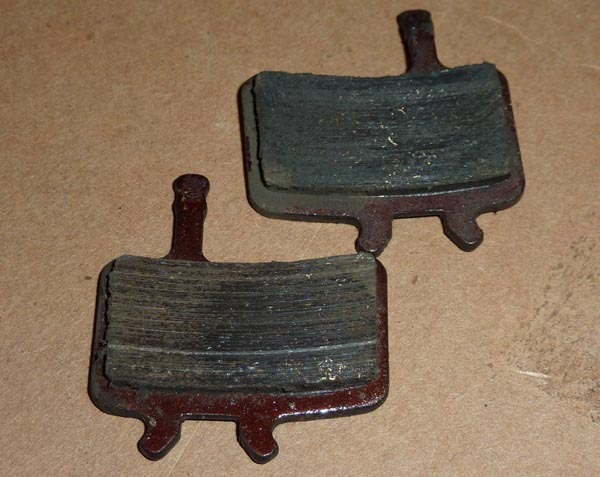 I would say that the pads were uneven thickness to start with. Use them some more and the full pad will contact the rotor. 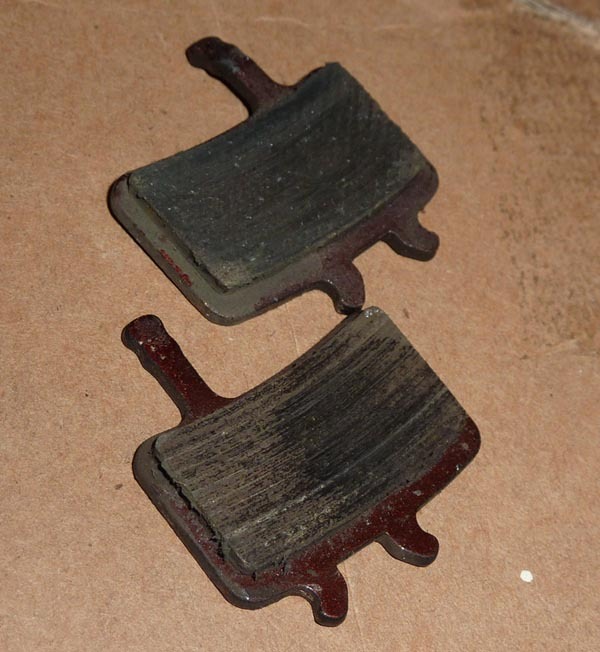 Also at only 50 miles the pads won't be fully bedded in so full braking potential will not have been reached. Clean em' up with sand paper. Wipe the rotors with alcohol, reinstall and ride. Thx for the feedback. I'll try to sand 'em with some 400 or 600 grit sandpaper and clean with alcohol. Someone from another forum did mention possible contamination judging from a very light dark streak running through the middle of the rotor's contact with the pad. I'll try putting them over a stove fire for a couple minutes as well (seems other ppl do the same with stock Avid pads). I'm just worried it won't fully decontaminate after months of sitting in the basement. I went ahead and replaced the pads for $20 - didn't feel like risking overbaking and affecting the glue. However, the old ones when dissassembled and sandwiched together, there is a tiny gap in the middle so the pads didn't seems to be flat and even on the rotor. Seemed like guesswork so didn't bother fixing them. Give them a "sand" and put them in your saddle bag. They might let you or a buddy ride home one day with some brakes rather than no brakes. 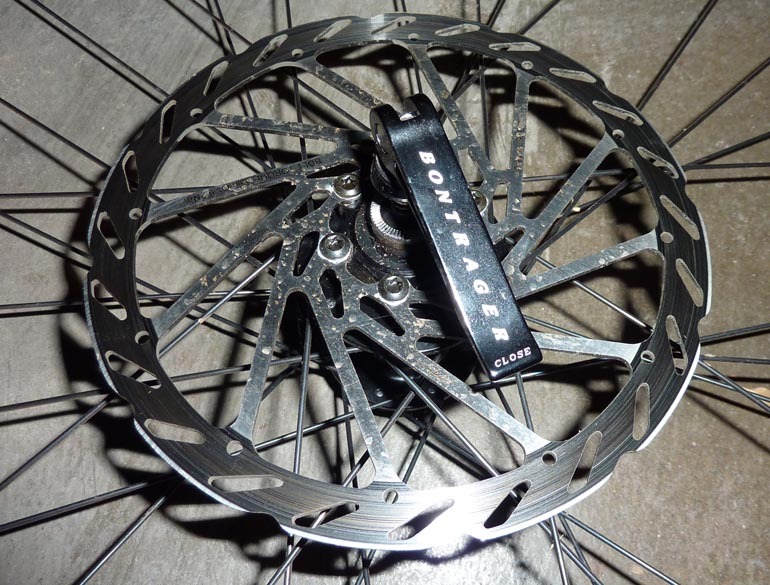 This could also increase your braking power even with new pads etc.... From the picture of your rotor it looks like you caliper (hence pads) might be riding a little low on the rotor (scraps down on the spokes). Can't tell from your picture if your pads are contacting the outer edge of the rotor or not? But if they are not, put some shims under one or both CPS bolts to raise the caliper to get more pad contact up on the braking surface. It'll make your brake run smoother and quieter! Yep, I'm gonna sand the old ones as backups. blcman - you're right! The front is about 2 full mm from the outermost edge, and the rear is 1mm too low. Now to find some washers.